The state government envisages to make Kerala the global capital of AYUSH systems of healthcare and to position the state as a preferred AYUSH destination in the global Map. The Kerala AYUSH Health Policy 2016, which was released on March 3,Thursday, states that AYUSH systems of medicines will be made a preferred choice of treatment in primary health centres. 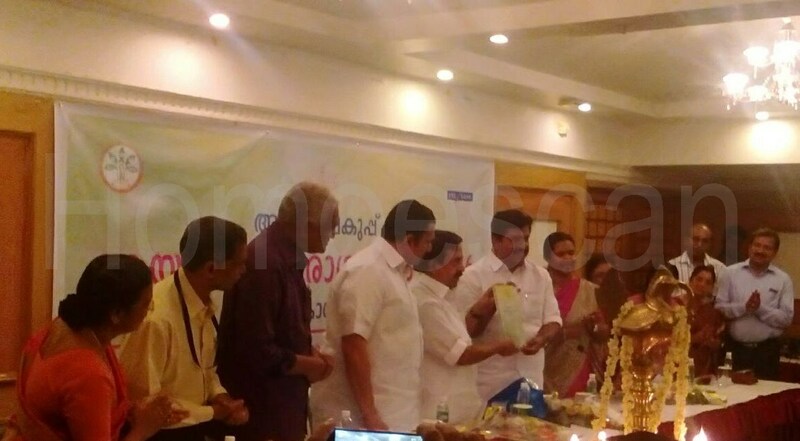 Home Minister Ramesh Chennithala released the policy by handing over a copy to Health Minister V S Sivakumar. K Muraleedharan MLA, ISM director Dr Anitha Jacob, Homoeopathy director K Jamuna, Ayurveda Medical Education director Dr T Shivadas and others were present at the function. The policy urges the AYUSH Department to jointly partner with the national and international tourism establishments to make the state the most preferred destination of AYUSH medical tourism and wellness tourism. The pioneering Kerala AYUSH Health Policy defines the vision for the next 10 years, it said, adding, it identifies strategic framework and key thrust areas for the development of AYUSH, that include AYUSH Medical Services, Education, Drugs, Tourism, Financial Allocations, Governance, Institutional Mechanism and Regulatory Framework among others. According to the policy, the state should have a public sector drug manufacturing unit for Siddha and Unani. On Medical Pluralism, the policy says that the state government should strive to provide the public with the right to choose treatment as envisaged by WHO and the National policy. It also says AYUSH holistic treatment centres will be established throughout the state and the potentials of AYUSH would be explored into other areas like veterinary sciences and agriculture. It also says that efforts would be taken to start block-level Ayurveda hospitals, taluk- level homoeopathy hospitals, specialty clinics in district and taluk hospitals. Moreover, the feasibility of starting Siddha hospitals would also be assessed. Considering that AYUSH has a wider acceptance among the tribal population, steps would be taken to provide AYUSH healthcare services to them. The policy also moots the establishment of wellness and palliative care centres. It has been said that the existing Government Ayurveda Research Institute for Mental Diseases in Kottakal, will be upgraded to a centre of excellence. As part of medical education, AYUSH University would be established to enhance the quality of AYUSH health stream. It also states that efforts would be taken to frame accreditation standard for medical colleges. It also calls for establishing different streams of medical colleges. In school syllabus, AYUSH subjects would be included, the policy says. It also plans to provide effective control and treatment of communicable and non-communicable diseases. At a time when objections are coming from various quarters of the traditional healthcare systems in Kerala demanding the Union government to separate Homoeopathy from Ayush streams, the government of Kerala is going ahead with a new Ayush Health Policy (AHP 2016) that provides immense promotional support to the German treatment system which has an inheritance in India of 125 years. According to the AHP 2016, even though Homoeopathy has a history of 125 years in India, it was recognised first in Kerala in the year 1928. The AHP, released last month, gives emphasise mainly on academic, research, clinical and institutional developments for this system in the state among other Ayush streams. One of the major proposals, the policy highlights is that Homoeopathic dispensaries would be started in all panchayaths, municipalities and corporations to attain 100 per cent healthcare. Another focusing point is that the ‘Chethana’ cancer treatment and palliative care programme under the Department of Homoeopathy would be extended to all other district headquarters. It is said that the state government would make an effort to involve local bodies in Rapid Action Epidemic Control Cell in Homoeopathy (RAECH) programme for epidemic prevention. Similarly, a special project would be implemented through Anganwadis to avoid recurrent infection in children by improving their immunity through Homoeopathic medicines. The existing elderly care centre under Department of Homoeopathy functioning in district hospitals would be strengthened and extended. In the same way, the existing Homoeopathic Fertility Centres would be extended to all district hospitals, says the AHP. The government also plans to satisfy the Homoeopathic medical practitioners by recognizing their prominent demand. A Directorate of Homoeopathic Medical Education would be established for developing, regulating and monitoring the education system. Under this Directorate, a well-structured diploma and degree programme in pharmacy in Homoeopathy would be started. Even today Kerala has large presence of Homoeopathic hospitals and the state’s position is second in India. In Kerala Homoeopathy was included in the public sector of the health care service in 1957.